Heald Green is a suburb of Stockport, Greater Manchester, England. 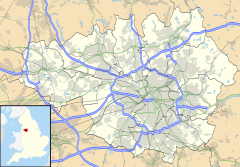 In the south-west of the borough near Manchester Airport, it is bordered by Gatley and Cheadle to the north, Cheadle Hulme to the east, Handforth and Styal to the south and Wythenshawe to the west. Heald Green railway station is on the Styal Line and is linked by a spur to Manchester Airport. At the 2001 Census, Heald Green had a population of 12,640, of whom 6,520 (51.6%) were female and 6,120 (48.4%) male, 2,494 (19.7%) aged 16 and under and 2,409 (19.1%) aged 65 and over. Famous residents have included world snooker champion Alex Higgins, Lancashire cricket players Johnny Briggs and Clive Lloyd, Sarah Harding from Girls Aloud, Coronation Street's Simon Gregson, Manchester City players Paul Dickov and Derek Jeffries and 1990s band Northern Uproar. This page was last edited on 18 September 2018, at 15:48 (UTC).